GUESS WHO? BRIDE OR GROOM? CIRCLE BRIDE OR GROOM OR BOTH! - ProudMummy.com the Web's Community for Mums. Home » Memes » Weddings » GUESS WHO? BRIDE OR GROOM? CIRCLE BRIDE OR GROOM OR BOTH! GUESS WHO? BRIDE OR GROOM? CIRCLE BRIDE OR GROOM OR BOTH! 1. WHO SAID I LOVE YOU FIRT? 2. WHO IS PLANNING THE HONEYMOON? 3. WHO MAKES THE BED EVERY MORNING? 4. WHO IS THE BETTER DRIVER? 5. WHO TAKES LONGER TO GET READY? 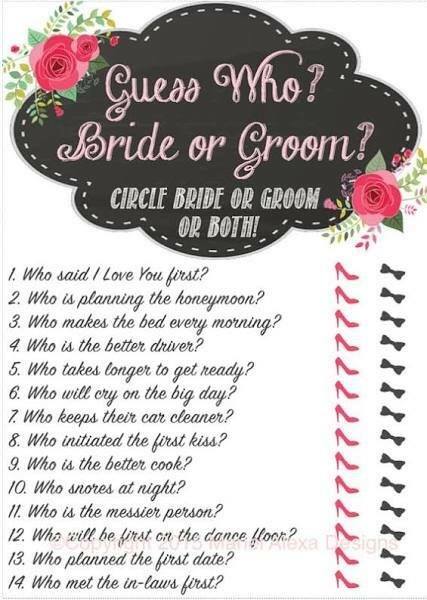 6. WHO WILL CRY ON THE BIG DAY? 7. WHO KEEPS THEIR CAR CLEANER? 8. WHO INITIATED THE FIRST KISS? 9. WHO IS THE BETTER COOK? 10. WHO SNORES AT NIGHT? 11. WHO IS THE MESSIER PERSON? 12. WHO WILL BE FIRST ON THE DANCE FLOOR? 13. WHO PLANNED THE FIRST DATE? 14. WHO MET THE IN-LAWS FIRST?